This natural salmon dog treat recipe is gluten-free and grain-free, rich in Omega-3 fatty acids, antioxidants, and protein. 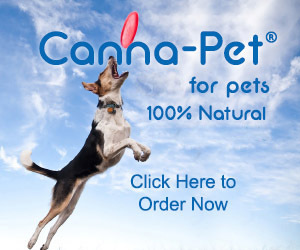 It is an excellent treat for all dogs of course, but especially for older dogs. The ingredients (e.g. salmon, turmeric) have anti-cancer properties. Yummy and healthy! 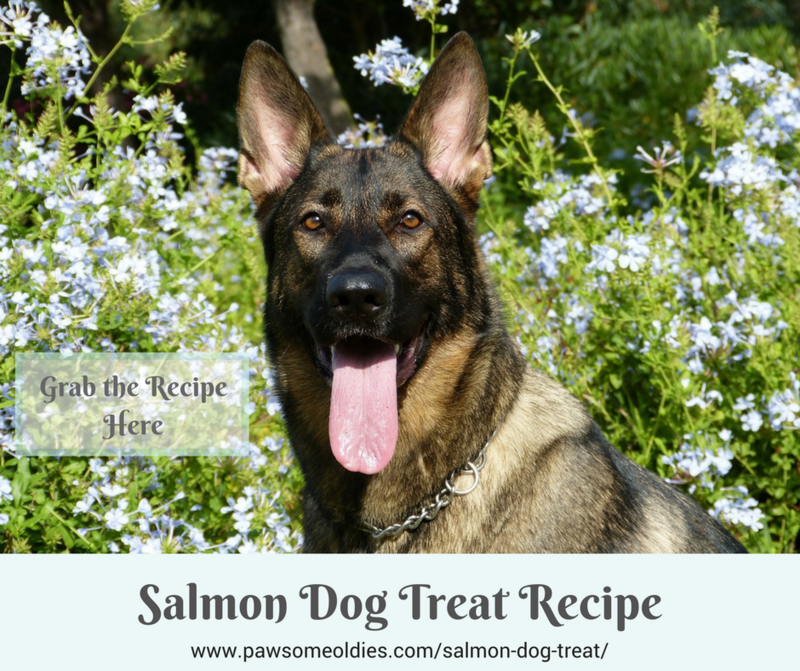 This salmon dog treat is extremely easy to make – it takes about 10 minutes to prepare and 20 to 25 minutes to bake! It just proves once again that making tasty and nutritious treats for your dog is simple and doesn’t take up too much of your time. For some reason (don’t know exactly what – my dog didn’t tell me), many dogs like fishy taste and smell. If your dog is one of them, this treat will no doubt be a big hit! As you know, salmon is rich in anti-inflammatory Omega-3 fatty acids, which have lots of positive effects on the many parts of the body, including the brain, joints, skin, and eyes. The Omega-3 FAs can also lower risks of certain cancer (breast, colon, and prostate) in human. In addition, salmon is rich in antioxidants such as selenium, which can prevent inflammation of the joint and certain types of cancer (e.g. stomach, prostate, liver). 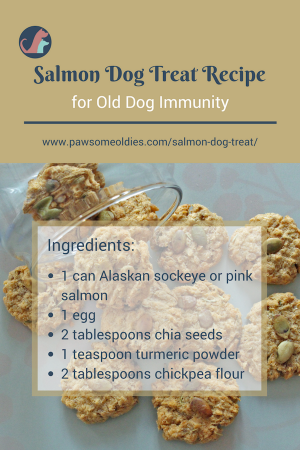 So this salmon dog treat is a good way to give healthy, anti-cancerous foods to your old dog to reduce risk of cancer. As well, salmon is a great source of protein. A few recent studies have shown that the bioactive protein molecules (called bioactive peptides) in salmon protein may provide special support in various areas. For example, supporting and maintaining joint cartilage integrity, effective use of insulin, and the control of inflammation in the digestive tract. Turmeric is an herb that has amazing health benefits for both people and dogs. It is a powerful antioxidant and has anti-inflammatory and anti-cancer properties. It protects the liver, and enhances the digestive and cardiovascular systems. Turmeric also contains high amounts of vitamin A, minerals, and protein. For dogs, especially older dogs or those with chronic diseases (e.g. arthritis, allergies, diabetes, cognitive dysfunction, heart and liver diseases), turmeric is a good herb to add to the diet. 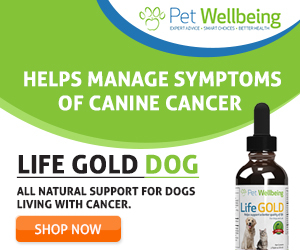 Dogs who are fighting cancer can also benefit from this herb. Chia seeds’ rich antioxidant and protein contents are beneficial to older dogs and those with weakened immune systems. The high fiber content in chia seeds makes them a low glycemic food, meaning eating chia seeds does not lead to a sudden surge in blood sugar, so they are good even for dogs with diabetes. Also, the high fiber content promotes a healthy digestive tract. It can help control minor tummy problems that many older dogs have from time to time, such as constipation, diarrhea, and inflammation. Chia seeds can absorb up to 10-12 times their weight in water. After absorbing all the water, the seeds become gelatin-like and expand in the stomach, giving a sense of fullness. So chia seeds are a good food ingredient for obese dogs who need to drop a few pounds. The high content levels of calcium, magnesium, and phosphorus make chia seeds a good food for bone health. Phew! Amazing how this tiny seed can pack such a healthy punch! Preheat oven to 350°F (180°C) and line a baking sheet with parchment paper. In a bowl, mix all the ingredients together. Roll into 1″ balls and put them on the baking sheet. Flatten balls with a fork. If you have pumpkin seeds, press one or two into each treat. Use other whole flours, such as coconut flour, almond flour, oat flour, etc., if you don’t have chickpea flour. If you don’t have salmon, use canned sardines. As these treats contains fish, remember to keep them in the refrigerator. They will last for one week – but most likely your dog will devour them in 2 days.